Going out into the community is really really hard. Unless you know someone, putting yourself out there has got to be one of the hardest things to do. And from experience I don't think that poor community contact is worth crying about (I've done my share of pouting and grumbling). Sooner or later, it will all work out. Throughout this process it took me talking to 20 some-odd people about something I wasn't sure had any worth to find out what works best is just what feels natural. I originally started out hoping to get low-income families interested in self-sustainability, in growing their own goods, harvesting their labors, and reaping these benefits for their own good/health. To me it just made sense: an obvious solution to a problem laden with dependency and insecurity. Not until I went out did I understand/hear the real "why"s, and reconsider. Its true, I've refocused my issue. Pulling back from gardening and all low-income KC, I've chosen a more focused demographic—one that naturally cares about their health and others (their children). Mothers of low-income families don't have expendables, therefore time is of the essence. And if food is the issue, then food shall be the solution. Still focused on coaxing Kansas City into the kitchen, I want to facilitate a space and time that is focused on good food, without extra cost, that simultaneously betters family dynamics. How can a minor revolution, one of better planning and the act of eating/feeding, be non-intrusive, educational (without demeaning), and sensible? The women that I met with, Darla & Brooke, are both on EBT. They are both under the age of 30, and unmarried. Darla has 2 children under the age of 8, and Brooke has 4 under 10. Cooking was something they were both very interested in doing and had voiced almost identical concerns/complaints. "When I feel like cooking, and I have the time, Its a struggle to make things kids will like. So dinner usually goes like this: 1 vegetable, 1 meat, & 1 starch. Its usually chicken, something canned, & bread—Boring. It's either that or pizza, depending on how much time I have." So how can you reconfigure similar ingredients without being bland? How can you teach someone to save grocery money through shopping? How can kids be integrated into their meals (w/o having 4 completely different dinners)? How can you save time & cook? 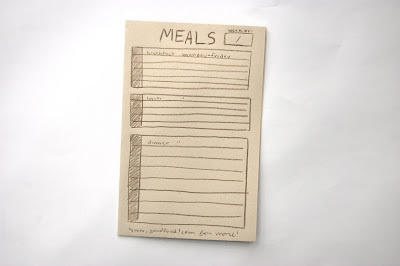 What is the most efficient and productive system of meal-planning? How can system components move someone along the gradient more than once? 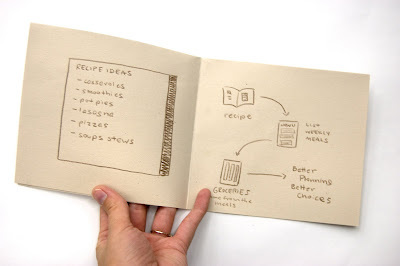 I imagine the process would work something like this: find a recipe(s) in the book, fill out the menu for that week (as many days as you wish), and then list the ingredients you'll need at the store. The recipe book is full of good pointers and recipes: how to stretch your dollar, how to reuse extra ingredients, recipes under 15 min, make-ahead cooking, kid friendly foods (or how to hide the good-for-them stuff), how to make your kids an active part of their nutrition, benefits of "going the extra mile" (like soaking dry beans rather than using canned), and giving the reader options (going the extra mile, or not!). "It's always the same thing: 1 vegetable, 1 meat, and 1 starch." I don't want this to be the case anymore. The meal planner has some tricks up its sleeve too: giving the household the option to designate an "ingredient of the week" to alleviate any wasted food (extra carrots, potatoes due to bulk packaging), and its broken up into 3 sections—breakfast, lunch, dinner. Within each dinner meal, there's a section for the main ingredients and the time it takes to make so the mom's can judge if "tonight's a good night to do that." The grocery list generator is layered with information as well: like the "all out of" pad each section of the grocery store is listed with common buys below. 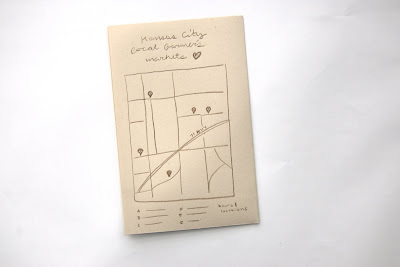 On the back though, I've opted to add a map of Kansas City's farmers markets with hours. Since most of these mom's can't afford the internet, this type of information is hard to come by. And anything that's difficult for a mom to do doesn't usually happen, so by making these places easy to find (and instigating their usage), they could make better decisions. Also, advising the mom's to "shop around the perimeter" and forming the grocery sections with this in mind could help. Not to mention that just having a list will keep the family from buying things they don't really need. Most of these ideas, I didn't come up with on my own. Things I never would have thought of came up in my conversations with these girls. For instance the wasted food thing is really common, and when I'm just tossing out flimsy carrots these women actually feel the loss; Food = money. 15 minute recipes are a little bit of a stretch but that's the challenge, if they need it then it's my job to figure out how to make it happen, I guess! 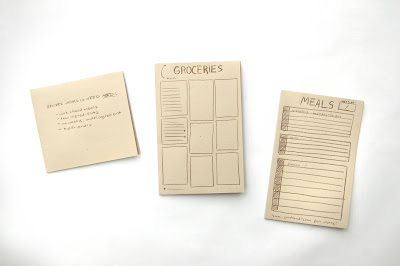 I originally had all the meal sections sized the same, but—as I found out—there's no time for breakfast or lunch cooking ("it's a pop-tart or granola bar, a PB&J, and then off to school"). Dinner is the meal they can actively be a part of ("so make this section bigger"), but even with this new knowledge, Tyler suggested that mom's can shape those on-the-go meals too! Instead of a pop-tart, what's a quick alternative? Judging which meal you want to pick based on the time it takes is an interesting addition to the menu list too; Somedays its just like that, so how can quick dinners no be bad dinners? 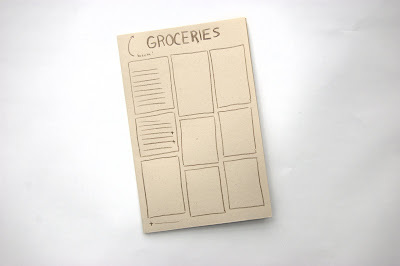 And who knew that having an permanently attached pen to your grocery or meal planning pad would be so important? "The kids might take it for a project or homework, I'll never see it again, I'll have to find another in the mess of my house... ugh!" I know these moms want to take care of their children, and they want to build lasting relationships with them, but on a budget things can get difficult. I'm hoping that this system will save time, money, and make eating an important, easy, and fun family activity.